I couldn't help but laugh when our latest shipment from Nuby arrived for the boys and I opened it to find this guy, the Jiggle Giggle Teether by Nuby. They certainly weren't kidding about the "giggle" part. 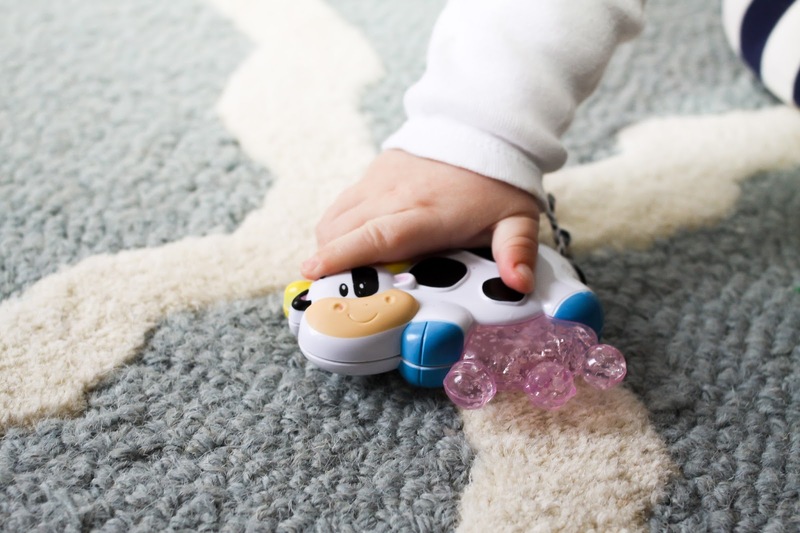 As far as being an effective teether toy, with its purICE gel that stays colder longer than your traditional water-filled teethers, this little cow sure does the trick. Not only does it stay colder longer but it also vibrates. Yes, you read that right. The cow's udders vibrate as your child teethes on them. I'm having trouble writing this post without laughing. Perfectly sized and suited for little hands and mouths, with it's bright bold colors and multiple raised surfaces, this teether is an excellent addition to our arsenal of chew-able soothers. Disclosure: I received this product free of charge in exchange for my honest thoughts and opinions on it as an official Nuby Mommy Blogger. I did not receive any financial compensation for this post. that is hilarious. I'm sure Avery would love it and I'd get a kick out of watching her with it!